Welcome to the CREATIVE ZONE! 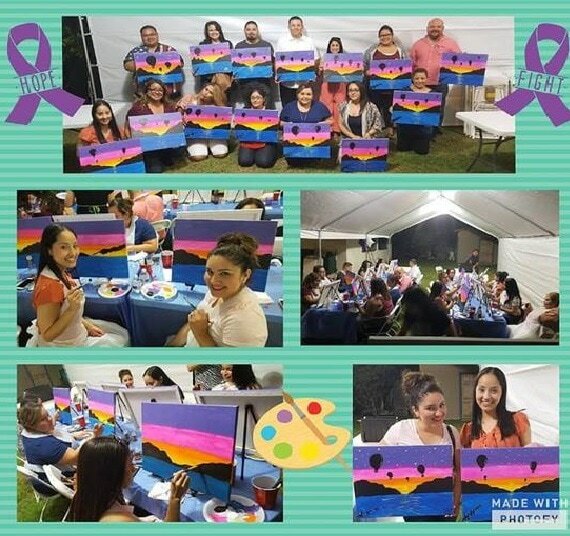 HOST A FUNDRAISER FOR YOUR FAVORITE ORGANIZATION WITH A Splash of Color PAINTING PARTIES! Have you been charged with coming up with your non-profit's next fundraiser? You've come to the right place! Let A Splash Of Color raise the FUN and FUNDS for your non-profit organization. A truly unique fundraising idea, our team will supply ALL the necessary art supplies and materials for up to 100 participants (canvases, tabletop easels, paints, brushes, napkins, and your live instructor. First we work together to choose which fundraising option works best, we select a date, then together we create an event personalized for you and your organization - including help in selecting your group's painting. It's your event - you get to choose the artwork! PLUS everyone goes home with the most unique keepsake ever - their very own 16x20 canvas painting! A Splash Of Color parties are fun, unique, entertaining - and because they're artist-led, absolutely no art skill is required! $0.00 travel fee if over 50 painters. Client provides tables and chairs. we can come day time or evening time we have flexible times. A paint party for any organization is a powerful way to connect with your supporters and provide an enriching team experience. You and your organization/group can choose the desired painting or we can design or choose one that becomes a good fit for the nature of your organization. We Promote your organization and the event with Posters, Flyers, email newsletters, facebook posts. No travel charge and 25.00 per person. if less see pricing below. instructor chooses painting for the day for the 1 hour class. instructor will bring: table easels, canvas, paint, cups, plates, brushes, and napkins. (We don’t provide wine) it is your private residence so feel free to provide the drinks of your choice to your guests. you choose the painting for the day for the 2 hour class. see our gallery or choose from Pinterest.com searching beginner paintings, we will get inspired by your choice and create something similar to create an original. up to 70 miles from 92395. Call for a quote.